Have you seen that commercial where a family is out to dinner and someone orders a caesar salad and then Julius Caesar shows up on the table? I have no idea what the ad is trying to sell, but consider me unsold, because I HATE that ad. Sure, commercials are something I barely have to put up with anymore, thanks to my DVR, but even so, lazy ad writing really irritates me. That ad only makes sense if Julius Caesar has anything to do with caesar salad, or if it’s even remotely Italian, and since caesar salad was invented in Tijuana by a man named Caesar, neither of these things is true, and that commercial is nonsensical and (probably irrationally) offensive to me. I made caesar dressing! Not in response to that ad, really (or oh, no, was it? ), but I was craving a good caesar salad, and so here we are. 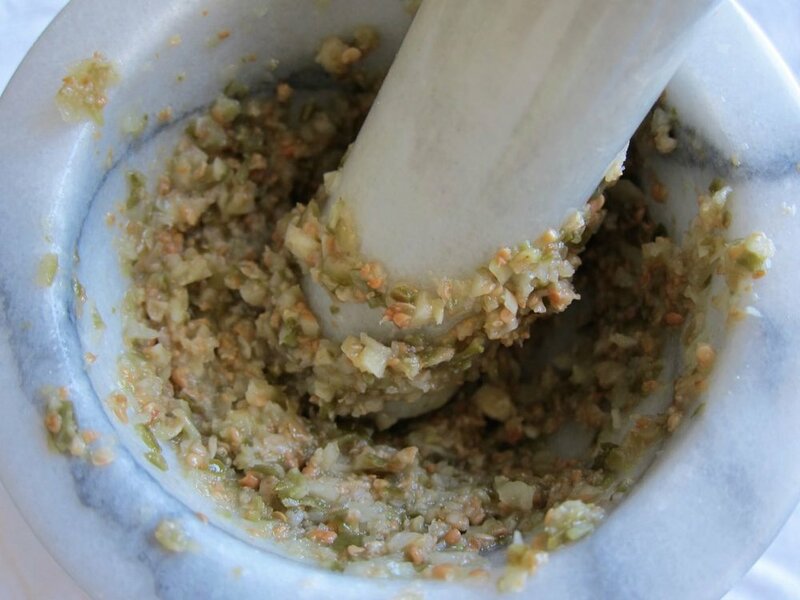 This dressing has nothing to do with ancient Romans or Italy, or even the Tijuana “original” recipe, but it is definitely in the realm of caesar-ish, so I’m still going to call it “caesar” and anyone looking for anchovies or eggs can go elsewhere to the many, many, many iterations of caesar dressing that exist. Perhaps here? But with that disclaimer out of the way, let’s talk about this dressing! It’s got all the flavors of caesar that I love, that mix of salty, creamy, tangy goodness that sits so well on slightly bitter, crunchy romaine. Here, instead of anchovies (which apparently aren’t even part of the original) we’ve got caper berries delivering the salt, which works so nicely I’m astounded I’m just hearing about this. It’s not that I mind the anchovies as long as I use the filet kind, but I’ve always felt a little weird knowing there are little fish blended up in my salad dressing. So bye, bye, fish. I’ve cheated on the egg component by using mayonnaise, which is just egg and oil anyway, but makes emulsifying so much easier. The rest is pretty standard, I think. The result, you must know, is an easy, satisfying example of the caesar dressing genre, one that I’m sure I’ll be making again, and not only because I’ve still barely made a dent in my jar of caper berries. And next time, I’ll show you what I did with this jar of goodness! Makes 1 1/4 cup dressing. Adapted from Damaris Phillips. Finely mince the caper berries and garlic, then sprinkle with the salt. 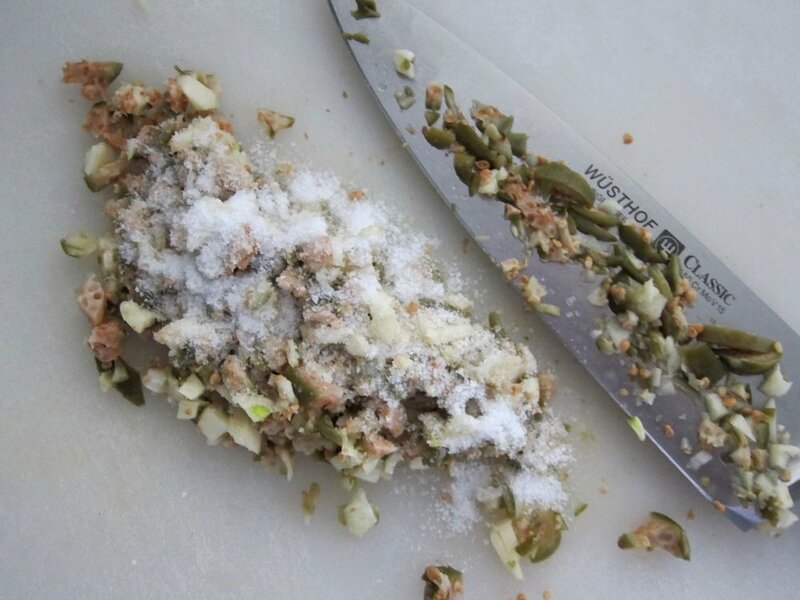 Either mash with a mortar and pestle or using the flat side of your knife. Transfer the paste to a bowl and add the mustards, mayo, sesame oil and hot sauce and stir to combine. Add the lemon juice and season with more salt to taste, if needed.